We all have our own tricks to make life more interesting, efficient or enjoyable. What about your workout? Did you set a goal at the beginning of the year and already feel bored or burned out? If you've lost some motivation, you are not alone. 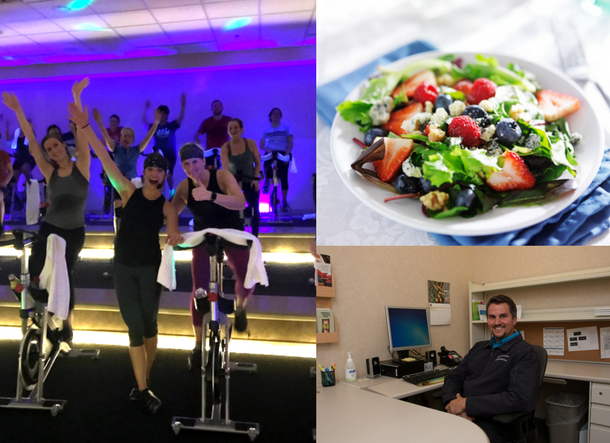 We wanted to pull some ideas for you to freshen up your routine and try some new things here at the DAHLC. Let's challenge ourselves to branch out from our comfortable workouts or routines and give something new a try. You never know, it could just become your new favorite thing! STRONG: A new offering, this is a full-body conditioning, high intensity class using traditional fitness moves that are synced with the beat of the music. See our drop-in schedule for times. Cycle Beat: A new offering as well. If you like the bike and you enjoy music, this is the class for you. Offered every third Thursday of the month, this class is a high intensity cycle ride in a nightclub atmosphere with lights and music. Strictly Strength: This small group training class focuses on improving and increasing muscle mass and gaining confidence in your strength routine. It is led by a Healthy & Wellness coach with 3-5 other participants of similar levels. Get Cooking: Need some guidance in the kitchen? Gain some inspiration from our chefs and dietitian as you watch and learn how to cook yummy and healthy dishes and then sample them as well. Feeling stuck trying to achieve your well-being goals? Look no further than our wellness coaching consults. You will meet with a Health & Wellness Coach on your schedule to define your goals and realistic ways to achieve them at your own pace with accessible resources. This is one of our most life-changing offerings and is catered to everyone. Swim lessons or workshops: As summer approaches, swimming lessons or learning a new swim skill could be right up your alley. Our instructors will make you feel welcome and comfortable in our warm 87 degree fitness pool. Other offerings include: Gear Up for Golf; Strength Training for Runners; Pilates workshops; Active Book Club; Achieve Results; Mission Motherhood; and Get Your Diet in Gear. You've got nothing to lose and everything to gain by trying something new and freshening up the routine! when can we submit pictures for the 2015 calendar? You may enter photos now until 4 p.m. April 2.
above it says 2014 calendar, did you mean 2015? The photo contest is for 2014 (this year), but the photos will be in the 2015 calendar. Please click on the link in the article for the contest brochure with full details. Thank you. thank you for changing the wording. this makes more sense now.